Large Day, originally uploaded by captainjay. 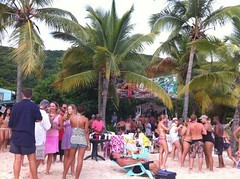 Soggy Dollar Bar's big 40 was all large. The turnout was huge and the weather men, thank god were wrong. It was a little bumpy this morning on the way over, we had a few sprinkles, then it turned plain old beautiful this afternoon.